Tipard Creative Zen Converter Suite for Mac is an affordable discount suite of Creative Zen Video Converter for Macand DVD to Creative Zen Converter for Mac. More specifically, this Tipard Creative Zen Converter Suite for Mac can convert video to Creative Zen Mac, as well as convert DVD to Creative Zen Mac. 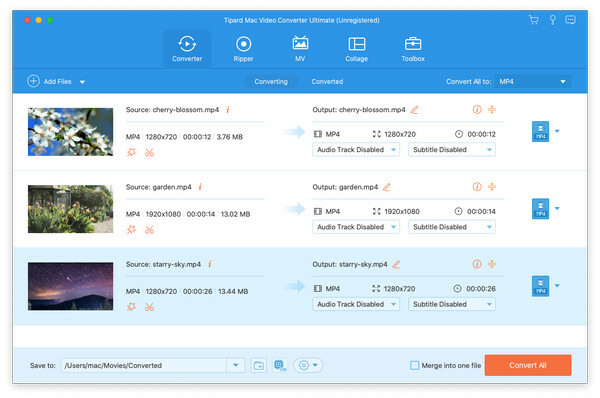 Plus, this Creative Zen Converter Suite for Mac can convert or extract the videos and DVD to Creative Zen MP3, WMA and WAV...audio formats. Convert DVD to Creative Zen AVI, MPG video format. Convert MPG, MPEG, MPEG2, VOB, MP4, M4V, HD video to Creative Zen video. When you are previewing the final effect, the Effect button assists you to design and customize the movie effect by changing video Brightness, Contrast, Saturation. Set multiple output formats for converting at the same time. So you can get those videos at one time conveniently. Tipard Creative Zen Converter Suite for Mac allows you to choose the audio track and subtitle (No Subtitle) for your converted video. Need to record your own gaming videos and software tutorials, or stream them live? Check the top 5 free screen recorder Software of 2017.